HDMI High Speed Swivel Cable 2.5 metre with swivel connectors. High quality HDMI high speed cable for transferring, uncompressed digital video, audio and control functions. HDMI high speed and HDCP compliant. 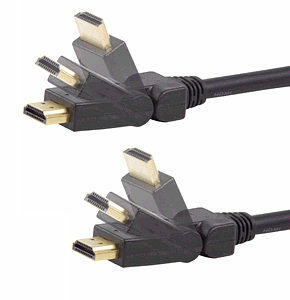 Special swivel HDMI cable with 180 degree movable connectors. Great for LCD Screens that have little space at the backside; for example when placed close to or hang on a wall.